The Hound of the Baskervilles (1939) is one of the 1001 classic movies you should see. 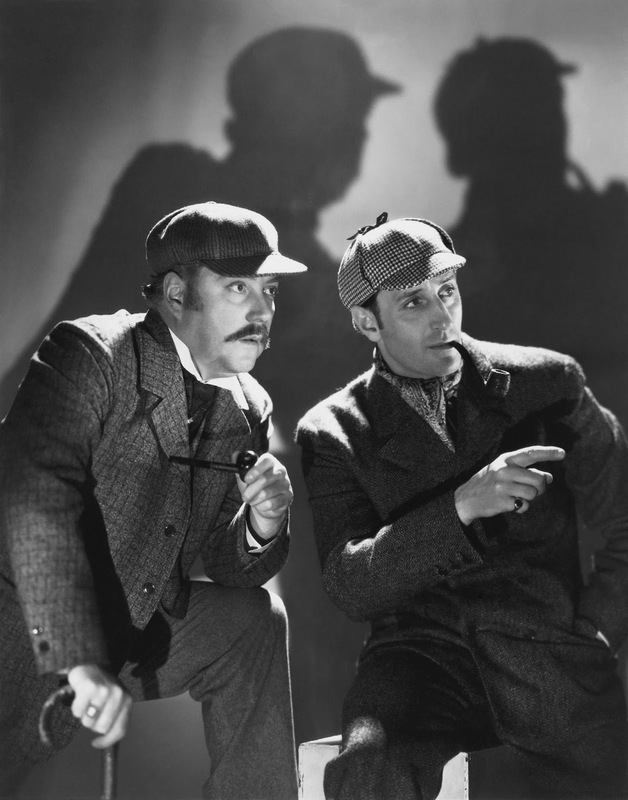 This mystery stars Nigel Bruce (left) as Dr. John Watson and Basil Rathbone as detective Sherlock Holmes. Each week, I'm going to recommend a classic movie you should see (for the reasons behind the 1001 series and reviews of earlier films covered go here). Throughout October, I'll be writing about old Hollywood films inspired by English literature. This week's selection is the 1939 adaptation of Arthur Conan Doyle's 1902 mystery, The Hound of the Baskervilles. The Hound of the Baskervilles tells the story of an ancient aristocratic family from Devonshire named the Baskervilles, whom, according to local legend, are haunted by a large supernatural dog. Private detective Sherlock Holmes (Basil Rathbone) and his partner Dr. John Watson (Nigel Bruce) are summoned to investigate after a member of the family (Ian Maclaren) dies in mysterious circumstances with the footprints of a large canine surrounding his body. While Holmes goes undercover to pursue his line of investigation, Watson travels to the Baskervilles' remote estate where the good doctor must protect the new heir to the family fortune (Richard Greene). The Hound of the Baskervilles had already been filmed several times -- a 1937 German-language version was reportedly one of dictator Adolf Hitler's favorite movies -- when 20th Century Fox studio chief Darryl Zanuck bought the rights to Doyle's novel for a lavish costume drama that was quite popular with audiences and launched Rathbone and Bruce as a screen team. They would go on to appear as Holmes and Watson in a total of 14 screen adventures. The Hound of the Baskervilles is mostly faithful to Doyle's chilling tale with some spooky scenes added for kid appeal and the part of leading man Richard Greene beefed up for maximum box-office draw (Greene was an up-and-coming matinee idol at Fox during this time period). However, The Hound of the Baskervilles most important role was establishing the iconography of the Holmes' character in the public's mind. Rathbone, with his tall, lean frame, deerstalker hat, and calabash pipe (photo below), effortlessly embodies the essence of Holmes' screen persona from the very first frame of the movie. 1. Watson. Bruce's version of Watson is a bit older and a bit more befuddled than the young war veteran portrayed in Doyle's stories, which has led to some criticism of the lovable English actor. I think Bruce does a great job with the character; his blustery bumbling and unwavering loyalty make him the perfect foil for Rathbone's cerebral portrayal of Holmes. 2. Sets. The Hound of the Baskervilles was entirely filmed on Fox's backlots. The large set for the Grimpen Mire (based on the real Fox Tor mire) is a triumph of set design, matte painting, and fog machines (the studio publicity department reported that Fox spent $93,000 on fog machines, which, once you see the movie, is completely believable). 3. Barryman/Barrymore. John Carradine and Eily Malyon play a creepy married couple who are servants on the Baskerville estate. In the novel, their last names are Barrymore, but screenwriter Ernest Pascal changed it to Barryman to avoid confusion with the famous acting family. In fact, John Barrymore played the great detective in a 1922 film. 4. Drug reference. The last of the line of The Hound of the Baskervilles is Rathbone exclaiming, "Oh, Watson, the needle!" This is a reference to Holmes' cocaine habit (cocaine was a legal stimulant at the time Doyle wrote most of his Holmes' stories). This line was removed by movie censors in 1939, but it was restored in the 1975 re-issue. 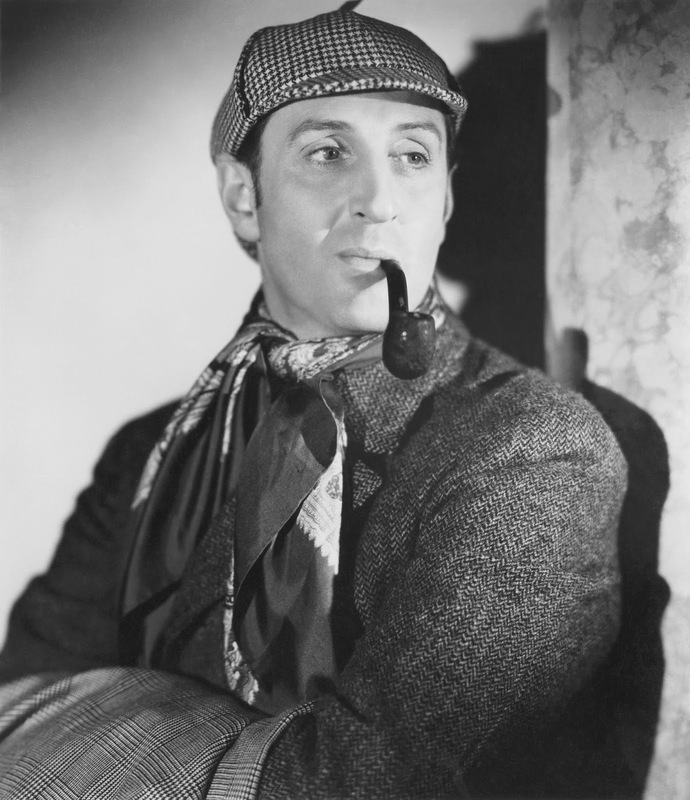 Basil Rathbone as Sherlock Holmes in The Hound of the Baskervilles (1939). Other critics: The Hound of the Baskervilles has an 100 percent fresh rating on Rotten Tomatoes and Leonard Maltin calls the film "fairly faithful" to Doyle's novel and "a grade-A production" in a 3 star review for his Classic Movie Guide. Critics in 1939 mostly liked the movie, singling out the chilling Gothic atmosphere for praise. The New York Times critic and Holmes fan Frank S. Nugent was enthusiastic, writing that the movie was "weird as all get-out. . .The technicians have whipped up a moor at least twice as desolate as any ghost-story moor has need to be, the mist swirls steadily, the savage howl of the Baskerville hound is heard at all the melodramatically appropriate intervals and Mr. Holmes himself, with hunting cap, calabash and omniscience, whispers from time to time, 'It's murder, Watson, murder!'" 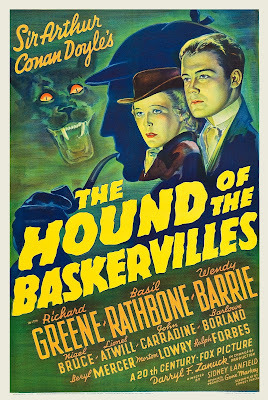 The Bottom Line: The Hound of the Baskervilles is the best of the Rathbone-Bruce Holmes movies, although I'm also fond of The Adventures of Sherlock Holmes (1939). The Gothic atmosphere, intriguing mystery, and Rathbone and Bruce's buddy act make this great old Hollywood viewing on a chilly autumn evening. Next week, I'll look at producer Val Lewton's horror movie version of Jane Eyre, I Walked with a Zombie (1943). You've convinced me! I need to watch this right now. But first, the kettle! Great Trailer!!! And I defiantly watch it after watching Restitution Road with my favorite starring Dina Meyer and Lea Thompson.